Maybe you’ve just been diagnosed with IBS by your doctor, or maybe you’ve checked a list of common symptoms, and strongly suspect you might have it. ...but understanding what you should eat if you have IBS can be a challenge. There’s a lot of information out there, and it can be confusing and even contradictory. Irritable Bowel Syndrome (IBS) is a chronic condition that affects between 10–15% of individuals worldwide. You can learn more about specific symptoms in this article. Unless it was caused by a severe infection, IBS typically has no cure. At present, the focus of IBS treatment is on managing and reducing symptoms. For more in-depth information about the difference between IBS, Post-Infection IBS, and SIBO, check this guide out! The good news is that with the right diet plan, the majority of people with IBS do see an improvement. Because all bodies, and all digestive systems, are different, there is no one, standard “Irritable Bowel Syndrome Diet” that will work for every single person across the board. However, there is a way to discover what your personalized IBS diet can be. It is possible learn what to eat to feel better, and what to avoid to minimize or even alleviate your IBS symptoms. What's a "FODMAP," you ask? 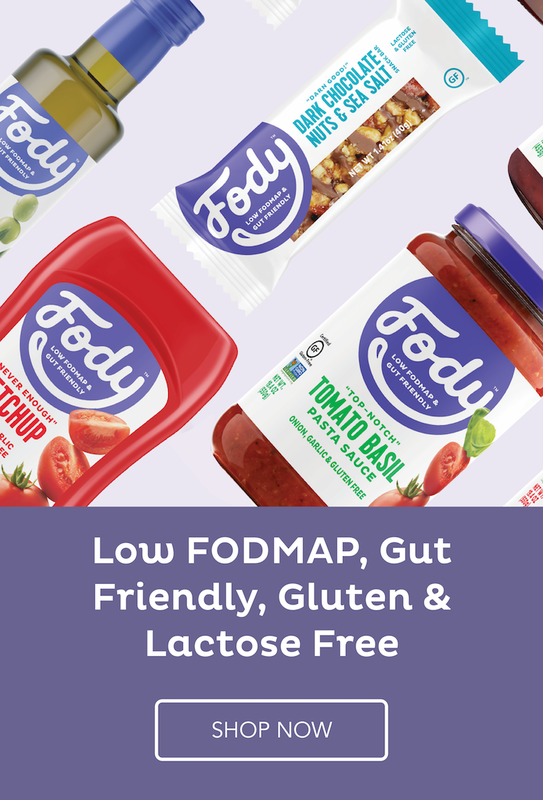 FODMAP stands for Fermentable Oligosaccharides, Disaccharides, Monosaccharides, and Polyols. To put it simply, FODMAPs are a type of carbohydrate that some people can’t properly digest. When your small intestine can’t digest them, they move into the large intestine, where they ferment, causing an excess of gas, and draw in water. This reaction is what causes the IBS symptoms, such as bloating and diarrhea. Fun. The earliest research into FODMAPs was done by Monash University, in Melbourne Australia. Back in 2005, they published their first paper on the topic, and since then, their contributions to the field of gastrointestinal health have become the gold standard in IBS treatment. What Monash University researchers discovered was that for people with IBS, eating foods that contained too high of a quantity of FODMAPs triggered IBS symptoms. If you suffer from IBS, it's likely that reducing the amounts FODMAP-containing foods in your meals means fewer symptoms. How do I make my FODMAP diet plan? ...which means you don't have to follow a strict set of one-size-fits-all rules. The goal is not to cut out foods forever, but to eliminate them for a short period of time, then carefully reintroduce them in order to confirm your specific sensitivities. It can also help you identify lifestyle factors, such as stress, sleep, and hormone changes, that also play a role in digestion. The elimination phase involves removing the high-FODMAP foods from your diet for a period of 4 to 8 weeks. The goal is to see a consistent improvement in your symptoms, confirming that you are definitely sensitive to FODMAPs. The challenge phase is when you carefully reintroduce the high-FODMAP foods back into your diet, watching for which ones trigger your symptoms. The ongoing phase or reintroduction phase is when you adjust your daily eating habits back to what is now your new normal. This incorporates not just the high-FODMAP foods that you can tolerate, but also balancing the behaviors, social settings, and lifestyle factors that sometimes ramp up your symptoms too. After following this process, the majority of people on the FODMAP diet are able to discover their unique tolerance levels to various high-FODMAP foods. ...but you won’t know what they are—or be able to avoid them—unless you test them out first. If you’ve seen improvement during the elimination phase, you might be tentative about inviting all those symptoms back into your life, but… wouldn’t you rather know what to avoid, so you can feel better? In this case, a little discomfort is worth it. Oligosaccharides, such as garlic, onions, leeks, beans, artichokes, dried fruits, plums, watermelon, wheat, rye, barley, pistachio and cashew nuts, as well as inulin (also called chicory root), a plant fiber often added to vitamins and supplements and low-fat foods like yogurt. Disaccharides, high-lactose foods such as milk and yogurt. Monosaccharides, typically found in foods with excess fructose such as asparagus, sugar snap peas, apples, fresh figs, cherries, mangoes, pears, watermelon, honey, agave and high fructose corn syrup. Polyols, found in fruits and vegetables like apples, peaches, blackberries, mushrooms and snow peas, as well as sweeteners like mannitol, sorbitol, maltitol, xylitol and isomalt. What’s left for me to eat? The good news is that there are plenty of delicious options available, even during the strictest elimination phase of the FODMAP diet plan. You’re not going to be crunching on ice chips and sadness for the rest of your life, I promise! My best advice is to focus on what you CAN eat. Use our 1-page cheat sheets to get started. Highlight all the low-FODMAP foods you like (or want to try), and think about meals you can create around those. 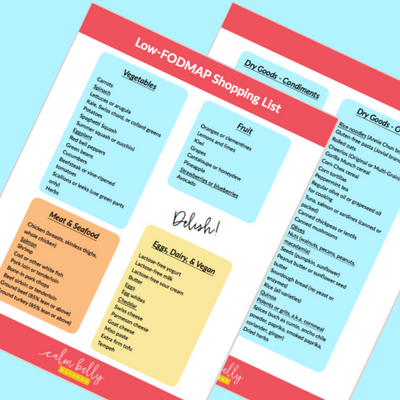 Click to have our FODMAP foods cheat sheets sent to your inbox! Does the FODMAP diet last forever? After the various categories of high-FODMAP foods have been challenged, and your specific trigger foods have been identified, you do not have to stay on the elimination phase of the diet for the rest of your life. In fact, it’s better for your body if you don’t. Many high-FODMAP foods still provide benefits to our bodies, when eaten in moderation. Adjusting to your new normal will take time. It’s a big change, especially from the mindset that tends to permeate our current way of thinking about food. Many of the foods that are commonly believed to be healthy and wholesome and oh-so-great might not be great for YOU. Especially if you struggle with IBS. Yes, fruits and veggies are important, but you might not be able to eat piles and piles of them. Even too much of a healthy food can make you feel awful. It’s all about moderation, information, and listening to your body’s signals. What else can help with IBS? It’s not just about what foods to avoid with IBS. Lifestyle factors can play a huge role, too. As I’ve mentioned before, portion size can influence your gut reactions, but things like time of day can as well. Big meals make our guts work harder to digest, and put it under more strain. Eating fewer, smaller meals throughout the day can help. For some people, avoiding spicy foods, artificial sweeteners, cruciferous vegetables (even if they’re low-FODMAP!) carbonated beverages or caffeine can make a difference. It’s all about you! What does your ideal, personalized IBS diet look like? For people struggling with GI issues, probiotics tend to be a great choice, and recent studies demonstrated a significant improvement in symptoms. Make sure, however, that the brand of probiotic you choose does not contain any FODMAPs, such as mannitol, inulin, and oligosaccharides. You wouldn’t want to take something to make you feel better, only to find out you’re just adding fuel to the proverbial fire. Check the label closely. Your IBS symptoms don’t have to keep you tied down, suffering, and struggling. With the FODMAP diet, you can identify your IBS trigger foods, eliminate them safely, and then begin to rebuild a new, healthy way of living. There’s so much more to learn, but hopefully this has been a useful overview if you’re just getting started with the FODMAP diet! If you want to know more, or want to learn how to get started on the path to targeting and alleviating your IBS symptoms, you can sign up for my free 7-day Calm Belly Challenge. Jumpstart your progress, get the tools you need to really make a difference, and kick those excuses to the curb. Start feeling better! What’s holding you back?